Talks to try and avert the planned tube strike this week are not going too well. Workers from the RMT, TSSA and ASLEF unions are set for a 24 hour walkout this week over pay and conditions. Station workers from the Unite union will also strike. 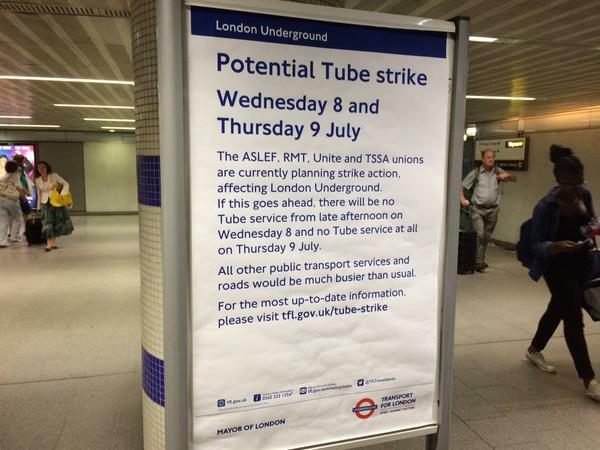 It’s worth noting that the RMT, Unite and TSSA strikes will actually begin at 6.30pm on Wednesday 8 July, whereas the ASLEF strike doesn’t kick off until 9.30pm. This obviously means the trains will start being run down around 6pm, so it’s probably wise to knock off early. TfL has advised that the tubes will be ‘exceptionally busy’ between 4pm and 6pm as a result. So there will be no tube services from 6.30pm on Wednesday and no tube service at all on Thursday. DLR, London Overground and TfL Rail services will continue to run. More #tubestrike talks today. Not much optimism dispute over pay & night tube can be resolved before 4 union 24hr walkout Wed 6.30pm. Basically, avoid London on Thursday. See TfL’s status update page for more information as it comes in. Update 2: So, yesterday LU apparently gave the unions until 6.30pm to consider its increased pay offer, or the offer would be withdrawn. LU now says that’s not the case; the offer is still on the table and it will be available for talks today. The unions appeared to refuse on the basis that it’s the 10th anniversary of the 7/7 bombings, so in the absence of any other information, the tube strike is being reported as still on. Update 1: Crikey. Looks like LU have pulled out quite a few stops and offered a 1% increase for all staff, plus a ‘transition bonus’ of £500 for staff (so 2%) and £2,000 extra for drivers on the night tube routes. This will mean an extra £2,500 for tube drivers. As Tom Edwards has noted, this is likely to put the unions’ collaboration on the strikes to the test if opinion is divided on whether or not to accept the deal.